Empathy for those who are ill and sick, this is not. This campaign is all about self-interest! The emotional blackmail has taken some time, but now in the USA, 25 States have legalised use of ‘medical’ marihuana while 4 states, Alaska, Colorado, Oregon, Washington and Washington DC have legalised recreational use of the drug. How on earth has this has been allowed to happen? Licensed medicines have to be single pure chemicals so that their effects are predictable and controllable and the correct dosage can be calculated. Clinical trials, which may take years, have to be carried out. Surely this is very widely known amongst the medical fraternity. So why do so many stay silent? 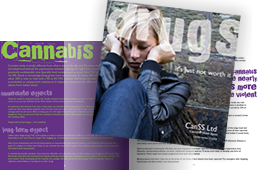 Cannabis, unlike pure heroin and cocaine, contains around 700 different substances. Cannabis and tobacco smokes are very similar in content but cannabis smoke has more of the same carcinogens. The effects of most of the other ingredients are unknown. No medicine prescribed today is smoked. The licensing process has already been carried out with purified cannabis extracts. THC (tetrahydrocannabinol) the psychoactive ingredient and CBD (cannabidiol) which is anti-psychotic, are the two main substances with medical potential in cannabis. It may come as a surprise to learn that pure synthetic THC (Licensed medicines Nabilone in the UK and Marinol in the USA) have been around for nearly 30 years. They are used to stimulate the appetite in AIDS patients, and counter the nausea from chemotherapy in cancer treatment. On the whole, doctors don’t favour them as they have too many side-effects and there are more effective drugs available. The legalisers don’t tell you this! Sativex, a mixture of THC and CBD has also been licensed for use in pain management, in Canada in 2005 and in the UK, 2010. Its effectiveness has been questioned. Pure CBD (Epidiolex) is currently being trialled for various types of epilepsy by GW Pharmaceuticals. There are no legitimate grounds for promoting whole marijuana as a medicine. There should be no further argument or discussion. No scientific study has established that marijuana per se is effective as a medicine. The folly of advocating its use, for example, to reduce the pressure in the eye caused by glaucoma, the patient would need to take it every 3-4 hours. Permanently stoned, they would be unemployable, incapable of driving or indeed doing anything productive. When talking to children about drugs, I ask, ‘Would you be happy to eat a slice of mouldy bread to get your penicillin, smoke cigarettes to reduce your weight (nicotine suppresses the appetite) or chew willow bark for your aspirin?